Koitsu, Tsuchiya (1870-1949) [Tsuchiya Koitsu] "Yotsuya Araki Yokocho" - Woodblock - Chinese and Japanese woodblock prints for sale, silkscreen, scrolls, watercolor, lithographs. Artwork Details for Koitsu, Tsuchiya (1870-1949) "Yotsuya Araki Yokocho"
Notes: Yostuya Araki Yokocho by Tsuchiya Koitsu. 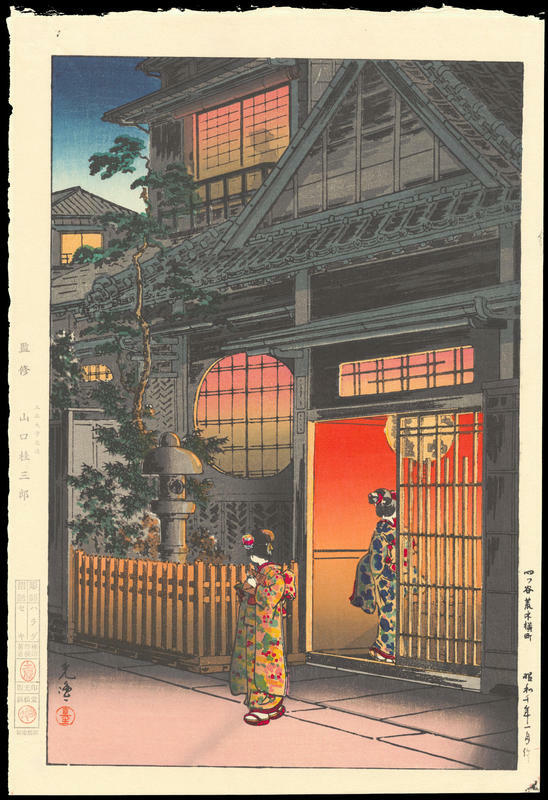 Genuine woodblock print dated January Showa 10 (1935). Later impression from original blocks. Fine condition. Never been framed. Harada carver's seal and Seki printer's seal in left margin. Nice details. Print measures 15.9 x 10.7 inches. Strong texture and ink bleedthrough on fine Japanese washi. This print is from a limited edition series entitled "Views Of Japan" of famous shin-hanga landscape masterworks from the artists Hasui and Koitsu, printed by the publisher Hamamatsu-Do (Doi), and also distributed by O-Edo Mokuhansha. In the early 1970's Hamamatsu-Do re-released this fine limited edition set of shin-hanga landscape prints. 28 scenes were chosen and the publisher printed 200 complete sets of 28 prints each. It is possible that later editions carrying the Hamamatsu-Do publisher seal also exist. Born in 1870 near Hamamatsu City (Shizuoka Prefecture) with the name "Sahei", Koitsu moved to Tokyo at the age of fifteen. He had planned to apprentice with Matsuzaki, a carver for the artist Kobayashi Kiyochika, but instead, he became Kiyochika's apprentice and moved into his home to study art and print design. It is through Kiyochika that Koitsu gained his trademark skill in the subtle use of light and shadow for his landscape prints. Koitsu lived with Kiyochika for 19 years and was considered more a member of Kiyochika's family than an apprentice. He worked and studying with Kiyochika until around Meiji 36 (1903). In Taisho 11 (1922) he moved to his wife's place of birth in Chigasaki City and lived there until his death. Although Koitsu first designed woodblock prints during the Sino-Japanese war (1894-1895), and later worked as a lithographer (around 1897 to 1905), he only really became a successful artist after his chance-meeting with Watanabe Shozaburo, the founder of the shin hanga print movement, at an exhibition of Kiyochika's works in 1931 that marked the anniversary of Kiyochika's death. In 1932 he started to produce landscape prints in the shin hanga style for Watanabe, the first being titled 'Cherry Blossom Viewing at Gion', and he went on to design a total of ten prints for Watanabe. He later designed prints for various publishers including Doi Sadaichi (known incorrectly in the West as Doi Teiichi), and a few prints for Kawaguchi, the Kyoto publisher Baba Nobuhiko, the publisher Tanaka Shobido, and the publisher Takemura. Around the same time that Tsuchiya Koitsu began his shin hanga career, another artist by the name of Ishiwata Koitsu was also pursuing a career as a shin-hanga landscape artist. Despite sharing the same given name "Koitsu", the two men were not related. Their works are sometimes confused since both artists signed their works "Koitsu". However, the styles of their woodblock prints are quite distinctive, as are their seals.